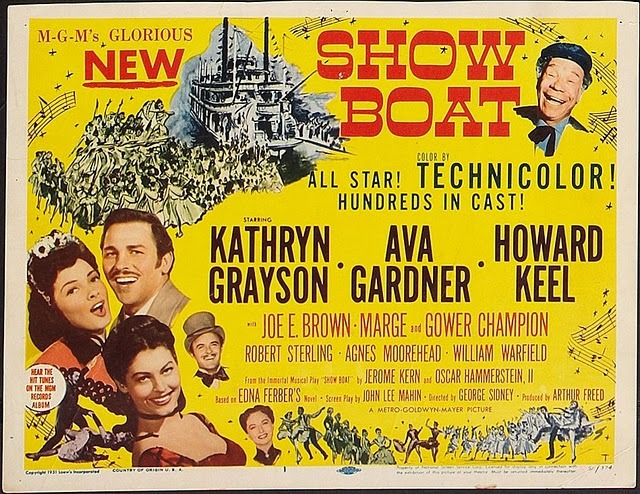 This week’s film: Show Boat (1951) – directed by George Sidney; starring Kathryn Grayson, Howard Keel, and Ava Gardner. There is something about the appeal of Show Boat that I don’t understand. This fact was made apparent to me during Tuesday night’s screening when I was surrounded by an overeager audience. There have been three film adaptations of Show Boat. The 1929 version was believed to have been lost but it was found, restored, and broadcast on TCM. The 1936 version is perhaps the most well-known film adaptation because it features Paul Robeson as Joe. Robeson’s rendition of “Ol’ Man River” is one of the entertainer’s signature songs. In comparison, the 1951 version is a lavish, Technicolor production. It is also one of MGM’s most profitable musicals. Because of the popularity of Show Boat, MGM was able to produce such films as Singin’ in the Rain and Seven Brides for Seven Brothers. Then the audience started arriving. Unlike most screenings, Show Boat attracted a large crowd. Typically about 10 to 15 people come to these screenings but more than 30 people came to watch Show Boat. (For a screening room that seats about 100, that’s a fairly sizable crowd.) This audience seemed to love every second of Show Boat. People were singing along with Howard Keel and Kathryn Grayson. People applauded after William Warfield’s rendition of “Ol’ Man River”. I have been running these classic film screenings off and on since 2005. It is rare that the audience reaction is anything other than silent appreciation. To experience the opposite while watching Show Boat was a reminder of the importance of seeing films – even the classics that you may have seen countless of times – with an audience. Every jaded filmgoer should be reminded of that every once in a while.